I’m a paper person. I was going to say that I’m a paper person because I believe in good paper goods (i.e. cards and stationery), but thinking about paper on a higher level, I love paper. I love reading a good paperback book, paper magazine, writing my to do list on paper - I’m trees worst enemy. Before I derailed there, I was going to say that recently I purchased a lot of cards. From Mother’s Day to Father’s Day to Birthdays, I’ve been keeping Hallmark (or in my case Kards Unlimited - SHOP LOCAL!) in business. I’m always looking for something unique when it comes to cards. Something that reminds me of the person receiving the paper product. I recently stumbled upon Julie Ann Art and it was love at first sight. 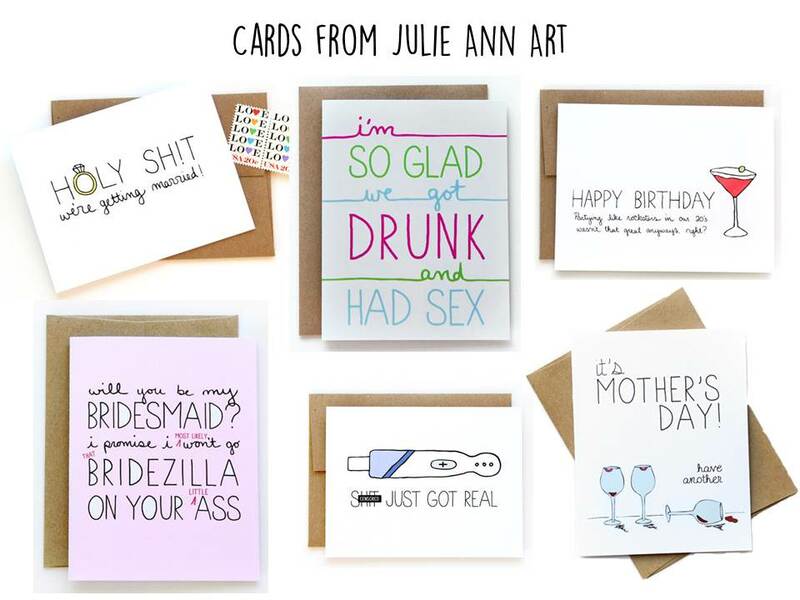 Her cards are witty and hilarious and perfect for my unique friends and family. So if you are in the market for a good card, check this chick out on Etsy!